CELLFOOD minerals are in the ionic state, the smallest size of a mineral to exist- also called concentrated electrolyte ions. They are the exact size the body requires for the individual cells to absorb them. CELLFOOD® brings to our diet the missing elements that modern technology and living has stripped away. CELLFOOD® delivers minerals and both oxygen and hydrogen to the body. This is the magic of CELLFOOD®. Most 'sport drinks' only contain 2 or 3 electrolytes. 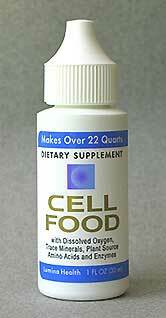 CELLFOOD® contains an incredible 78 electrolytes that can be used by your body instantly. Electrolytes are vital for athletes and sport people, because high intensity exercise requires a higher degree of energy production and fluid replacement. "The most important task we have is to reduce our neuro resistance and increase the speed (velocity) which these nerve impulses tell our bodies what to do. The best way to accomplish this is to increase our trace minerals and electrolytes. Here is the result of a recent electrical conductivity test comparing a group of mineral/electrolyte products; the goal was to activate the 50-cc reverse osmosis water activated circuit. This procedure is considered to be a good quality control test on mineral products. The higher the number of drops required in our test, the weaker the product; the lower the number, the stronger the product. The Cellfood® product was a runaway winner, being 3500% stronger in conductivity than the nearest competitor."